Brisbane 20 June 2013. The first mungbean variety bred from start to finish by the Queensland Department of Agriculture, Fisheries and Forestry (DAFF) will be planted commercially this year with high expectations of producing increased yields for growers. Minister for Agriculture, Fisheries and Forestry John McVeigh said the new mungbean variety was the result of research investment led by DAFF and the Grains Research and Development Corporation (GRDC) and was launched last night at the Australian Summer Grains Conference. “The new variety, named Jade-AU, will be available in limited quantities for planting this spring season,” Mr McVeigh said. “It is expected to give growers long-term benefits in production and profitability. In fact, an independent economic analysis has shown that this collaborative breeding project is delivering an 18:1 return on investment. 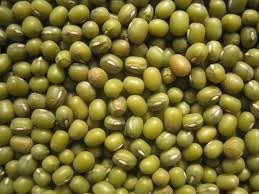 “Jade-AU is a large green shiny mungbean that fits Australia’s main export market. “It is expected to deliver up to $100 extra per hectare for growers compared to the current variety Crystal. “This is due to an average 12 per cent higher grain yield and its better tolerance of leaf diseases such as powdery mildew. “Jade-AU has proven performance across the existing mungbean growing regions from central Queensland to northern New South Wales. Mr McVeigh said the launch of Jade-AU at the Australian Summer Grains Conference highlighted Queensland’s leading role in tropical pulse research and as a preferred supplier of premium-quality mungbeans to international markets. Jade-AU is co-owned by DAFF and GRDC and protected by Plant Breeders Rights.